S E Lynes worked as a producer at BBC Radio Scotland before moving with her family to Rome. Back in the UK, she gained an MA in Creative Writing from Kingston University. She now combines writing with lecturing in creative writing and bringing up her three children. Had me from the first page. Riveting. A fabulous read - brilliantly written page-turner with the most stunning ending. Also raises many thought-provoking issues about women's strengths and their fragilities, about their friendships and loyalties. Taut and very well written. Wonderfully drawn out characters too. 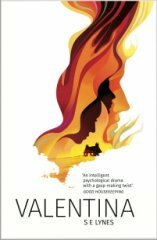 As a psychological thriller with a stunning, clever twist Valentina ticks all the boxes....and more! Luxuriate in Ms Lynes breathtaking use of language, imagery as she weaves this intensely atmospheric tale, with its emotionally articulate exploration of relationships - need, dependency, trust, betrayal. Spend time with her brilliantly carved characters - flesh and blood people who challenge us - who do we admire? respect? like? This is a superb Thriller. This is Great Literature. I can't wait for Ms Lynes next novel. A beautifully written, ingenious, gripping, psychological thriller. I absolutely loved this book and couldn't put it down until I'd finished every last word. A brilliant writer. The book has great characters, a clever plot with twists I never saw coming and wonderful tension. A well deserved nomination! Fast paced and well written . Read it very quickly. Great debut .! I'm grateful for Valentina as it's the one which brought me back to reading after over a decade of work related books and browsing the news. This is a great thriller that one can't just put down. I've found lots of layers to the story which I think every one will read differently. For me, it's a reflection of myself and/ or, the women around me, during and post pregnancies & babies phase. Fantastic! Beautifully complex characters, unexpected twists, fantastic story structure. Brilliant novel with as many twists to the plot as the country roads of Aberdeenshire where it is set. A thoughtful, provocative thriller that makes you think about trust, friendships and motherhood. Fantastic book that had me gripped to the very end. Fabulous debut novel! I loved this book! Fabulous read. SE Lynes is a breath of fresh air! I loved Valentina and was on tenterhooks throughout. Would be a well-deserved winner! A fantastic thriller, unputdownable and truly scary. A right page turner! Loved it. Loved this book, I was gripped from start to finish. A brilliant debut novel which is absolutely chilling, could not read it quick enough! A brilliant, intelligent, scary book. Brilliant debut novel by SE Lynes...absolutely gripping psychological thriller. Shona moves to Aberdeenshire with her partner Mikey and baby Isla to support Mikey’s oil rig work. Feeling lonely, she is delighted to meet the slightly exotic Valentina, but has no idea where this friendship will take her. Wow. I loved this psychological thriller. From the perfect cover image (which I can’t say too much about without spoiling the plot, but let’s just say it fits the story perfectly) to the three separate parts of the narrative, I found Valentina gripping and absorbing. SE Lynes writes pitch perfect prose so that each word adds to the build up of tension even when the reader guesses some of the plot outcomes. The characters are few – mainly Mikey, Valentina and Shona – leading to a claustrophobic feeling that made my heart race. So too did the dual first person narrative which I really enjoyed as it was separated into three distinct, thrilling, parts rather than the frequent see-sawing backwards and forwards of many novels. There’s an almost chilling straightforwardness here that pierces the reader’s imagination. The plot is so well planned with recurring themes and images that continuously build the tension and pace. It’s only on reflecting at the end of this breathlessly exciting book that the reader fully comprehends what a stylish, intelligent and well crafted story this is. S E Lynes made me wonder how well we ever really know those we love and caused me to consider the nature of identity. I found Valentina exciting and thought provoking and I was so completely absorbed in the story that time seemed to stand still as I read. Disturbingly, heart thumpingly psychological, Valentina is up there as one of the best thrillers I’ve read. Brilliant.